Back in July, we told you about a book coming out this October written by dear family friend, John C. Wilson called Noah, Tallulah, Cole and Me: A Memoir Of Broadway’s Golden Age. It’s getting rave reviews and has nearly sold out on Amazon! It really is quite spectacular—and something that everyone who loves Broadway should read! 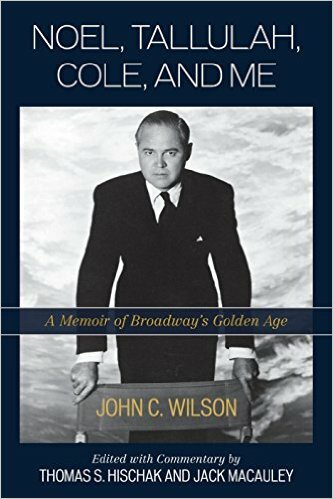 Readers of Broadway history might well remember the name John C. Wilson: longtime manager, gatekeeper and comrade of Noël Coward; producer of plays with Gertie, Kit, Tallulah and the Lunts, as well as Olivier and Gielgud; and director, within a year, of the original “Kiss Me, Kate” and “Gentlemen Prefer Blondes.” Little has been known of Jack Wilson until now, with the discovery of his unpublished and forgotten 1958 autobiography, “Noël, Tallulah, Cole, and Me.” Thomas Hischak has put the pages in order and filled in the gaps, resulting in an absorbing and fascinating description of thirty years of Broadway and West End history, guided by an unassuming fellow from Trenton who was thrilled and surprised to be in the center of it all. You can go online and order from Amazon—but hurry before they run out! With the holidays around the corner, it would also make a fantastic gift for the Broadway lover in your life!